I just found out that Scotch is giving away a free water bottle just for buying the tape every office already needs. I don't know the specific connection between Scotch brand tape and a Thermos brand bottle, but it is a pretty cool promotion. Most people these days are trying to "Go Green" and save a little money if possible, and a good water bottle is a great step in that direction. Fill up the water bottle at any number of easy to locate taps and take it along on day-to-day activities. When the bottle is empty just refill it and carry on. Reusing a plastic water bottle is "Greener" than buying and recycling plastic bottles from vending machines, grocery stores or gas stations because there is a good deal of energy needed to recycled that bottle and not all of it (like the cap or label) is truly recyclable. The water bottle in question here is a Thermos Intak Hydration Bottle. Those smart people over at Thermos know an occasional adult beverage might be consumed in this bottle so they call it a "Hydration Bottle" instead of a water bottle. The promotional material shows a green bottle, but I don't think there is a guarantee of any color that will actually be sent. The reviews for this bottle are generally positive, and those people had to pay for the bottles. I'm sure than anybody who received the bottle for free would rate it even higher. 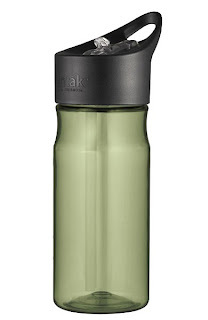 The product page lays out the details of the bottle pretty simply, but it is a BPA-free dishwasher-safe bottle with a water proof lid and a carrying loop. BPA was in the news non-stop for a year or so as manufacturers removed it from items in their line-up. Some plastics would release BPA when heated and then kids would drink it and be exposed to potentially unsafe levels of estrogen, so manufacturers have mostly moved to BPA-free plastics. The use of BPA-free plastics makes this bottle kid-safe as well. Nobody get this bottle completely for free though, some Scotch tape needs to be purchased and a rebate form needs to be filled out. Buy any combination of two qualifying products; MMM 810K16 (Magic Tape), MMM 600K12 (Transparent Tape), MMM 38506 (Premium Packaging Tape), or MMM 35006 (High Performance Packaging Tape) and mail in the rebate form with the UPCs. If the goal is to maximize the tape dollar to free water bottle tape ratio the Transparent Tape is the least expensive. The rebate form allows for 2 rewards per envelope and 6 rewards per unique mailing address so purchasing 12 boxes of the Transparent Tape and mailing 3 rebate forms will generate greatest return.